After eighteen years at the Humberside Police Force, Alfie Moore hung up his helmet and became a full time comic, storming the Edinburgh festival with hit shows in 2012 and 2013. Having since supported comedy heavyweights Sarah Millican, Milton Jones and Russell Kane on tour, and having toured his own successful show in 2012, Alfie embarks upon a new UK tour from May 2014. Sergeant turned stand-up, Alfie Moore has seen it all. This truly front-line member of the police force will not only alter your perspective on the ‘boys in blue’, but is guaranteed to have you chuckling from the rafters. Alfie was one of the stars of ‘Show Me The Funny’ (ITV) and wrote and presented ‘Alfie Moore’s Almanac’ for BBC Radio. More recently he has been featured on The Wright Stuff (Channel 5), Sky News, BBC Radio 4’s Idiots Guide to Crime and Punishment with Stephen K Amos and Bizarre Crime (BBC 3). 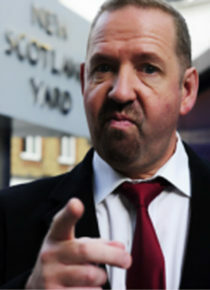 His new BBC Radio Four series It’s a Fair Cop is set to be broadcast over the summer.